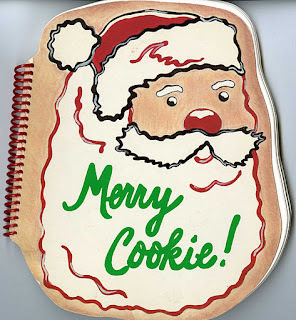 We recently purchased a cookbook called Merry Cookie! The cookbook compiled and edited by Judith Bosley boasts that it has “one hundred, old, new, luscious, rich, plain, fancy, pretty, buttery Christmas cookies.” Mmmm.. . Just in time for holiday baking! Did you know that the Clarke Historical Library has over 1300 cookbooks? 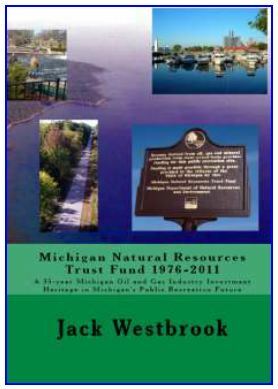 We have an extensive collection and most of them are from Michigan authors. In 2004, we received a generous collection of cookbooks from a private collector, and we have been actively collecting them ever since. Stop in the Clarke some time and take a look at some of these wonderful cookbooks. 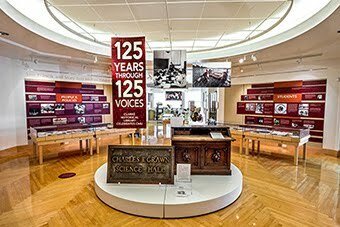 On November 1 the William L. Clements Library’s curator of maps Brian Dunnigan spoke about Michigan on the eve of the War of 1812. In a wonderfully illustrated presentation he shared with his audience the physical characteristics and lifestyle of Michigan’s non-Native American residents. The few settlers who lived in Michigan were primarily found in three settlements: Detroit, “Frenchtown,” (today’s Monroe) and on Mackinac Island. 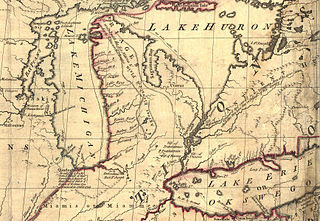 Detroit was the oldest and largest of the settlements. As the territorial capitol it also had the largest concentration of English-speaking “American” residents. Curiously, Detroit also had the newest buildings and the most unusual of street plans; the result of a devastating fire in 1805 that virtually destroyed the entire village. The resulting void allowed government officials to impose a new street plan that, unlike virtually every other settlement west of the Appalachian Mountains, featured extraordinarily wide boulevards radiating from great circles. Dunnigan noted in a sly aside that although the plan looked wonderful on paper, after about twenty years of residents constantly complaining about oddly shaped lots and streets consuming vast amounts of space that could otherwise be put to good use, the plan was abandoned. Frenchtown, located to the south of Detroit, retained the vernacular architecture and the largely French character that Detroit was beginning to lose. Indeed, one reason for the settlement was simply that some Francophones were not happy living in increasingly English-oriented Detroit. Then as now Mackinac Island was a seasonal community. During the summer upwards of 2,000 individuals would come to the island, which was a center of the fur trading industry. But as winter approached the population rapidly dwindled and only a few hundred souls remained on the island. Among them was a small garrison of U.S. Army soldiers, serving in what was considered at the time one of the most remote and isolated outposts maintained by the military. Dunnigan portrayed in images and words a world long lost and yet somehow strangely familiar. A remote country that nevertheless had a certain semblance of the home we know. It was a wonderful discussion of what was which hinted at what would emerge. Next Monday John Fierst will be talking about the editing of John Tanner’s Narrative, a project he and his co-editor John Nichols have undertaken to produce a scholarly edition of Tanner’s 1830 Anishinaabe account. The presentation is entitled: “The Captivity and Adventures of John Tanner: Editing an Anishinaabe Text.” It will take place on campus in the Terrace Rooms of the Bovee Center at noon, November 21st. Part of the Office for Institutional Diversity’s Soup and Substance series, it is being given in celebration of Native American Heritage Month. A large circus collection recently donated by Rev. James Challancin is being processed this term. Published materials, such as books, programs, and serials have been cataloged. Posters and scrapbooks have been processed and now thousands of clippings (all of which have to be photocopied), tickets, advertisements, and other miscellaneous items remain to be processed. Here is a digitized image of a damaged poster. 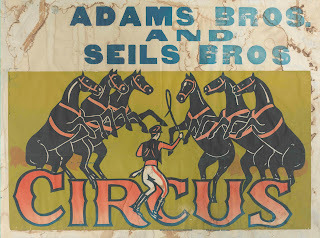 This Adams Bros. and Seils Bros Circus poster was printed by Neal Walters Posters Corp. of Eureka Springs, Ark., and advertised the circus performance in Caspian, MI (Iron County) in 1960. The collection has issues. A lot of it has a strong mildew smell, which is not good, and some of it has water or mold stains. Being around this smell is unpleasant even with an air filter and air freshners going full strength. Mold can spread throughout stored collections and cause health problems in people. Because we cannot expose staff or patrons to mold, we have to withdraw moldy materials from the collection. 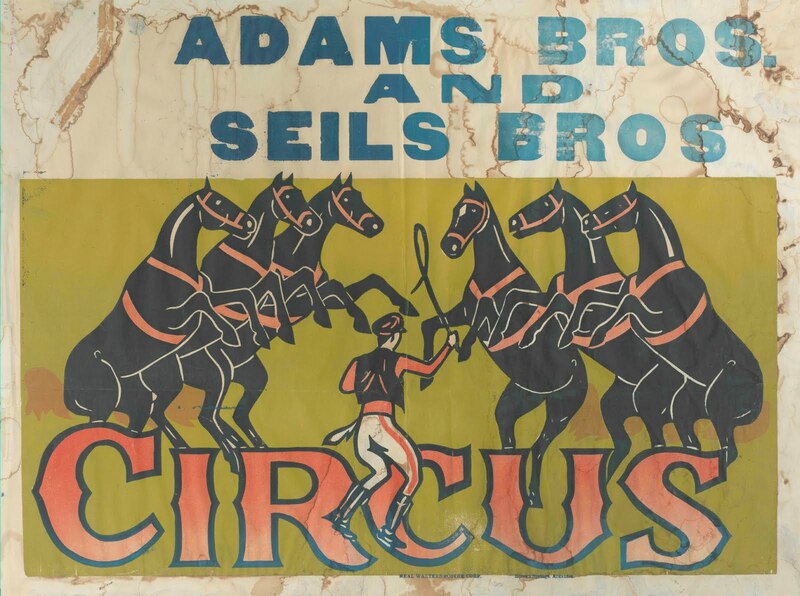 Fortunately, with modern equipment we have some options and can preserve a scanned copy of the poster so we could preserve a nice, colorful part of circus history without causing contamination throughout the collection or health issues to staff, students, or the public.